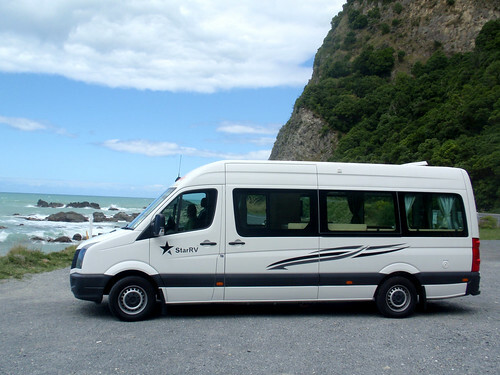 We had arranged for a shuttle to pick us up from our hotel in Christchurch and take us to the Apollo depot as it was 2km away from the airport and we had no other way of getting there. It was only $30 (£15) though so wasn’t too bad. We got to Apollo around 08:00 and went through all of the usual rigmarole when picking up a rental car before getting to see our new home for the next 6 days. The campervan Vanessa was very similar to the Maui one we had to drive across the Nullabor in Australia last month, but just not quite as higher quality sadly. Lots of the little extras that our “Marlene” had were missing from this one and it was slightly disappointing. Equally as it was a relocation deal, it was really cheap ($1 a day!) so we couldn’t complain too much! We hit the road heading north and pretty much trucked straight up SH1 along the east coast of the South Island all the way to Picton where we were planning on Freedom Camping for the night so we would be ready for our early ferry back to the North Island the next morning. We arrived about 14:00 and had lunch by the waterfront in beautiful sunshine (although the winds were really strong so it felt a little chilly!). We then drove 10 minutes back out of town to our Freedom Camping site just off the highway. New Zealand knows that many of it’s tourists want to be outside in it’s most scenic places where you normally won’t find any hotels, so they promote Freedom Camping where you can literally just turn up and either park your campervan or pitch a tent in a carpark, or field and stay the night for free. Some of these are nicer than others and we saw some amazing ones right on the shores of rivers or lakes and most have a small toilet block (no showers) and drinking water. Ours was a car park next to the highway so was not the nicest spot to stop, but it was free and was only for one night. It was flipping freezing that night though and with no electric hookup we were not able to have any heating on so we had an early night snuggled up under the duvet to stay warm. The alarm sounded at 06:00 the next morning and we opened our curtains to a blanket of fog surrounding us, but after a quick breakfast we were on the road and thankfully the weather cleared as we approached the ferry port. We checked in and got to board almost straight away, so found some seats near the coffee shop and settled in for the 3.5 hour trip back across the Cook Strait. 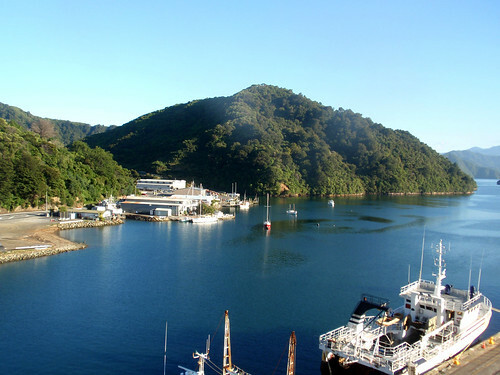 However after the first hour we had left the calm and sheltered waters of the Queen Charlotte Sound. The wind picked up, the waves got larger and before we knew it the ferry was rocking dramatically from side to side. We couldn’t handle it, both fighting the urge to throw up (with others around us not doing so well!) and we dashed outside to get some fresh air. We ended up staying out there for the rest of the crossing even though it was freezing cold to try and calm our sea sickness. Nick ended up lying down flat on a bench and somehow managed to drift off, but I just sat and beared it with lots of deep breathing until we finally reached Wellington and things started to calm down. Back on SH1 and back heading north it took us another 6 hours (with a couple of toilet stops and a break for lunch in a park) before we reached our destination for the next 3 nights; Taupo. 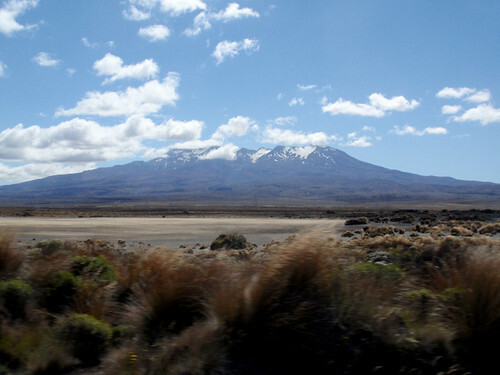 Our plan had been to stay inside the Tongariro National Park; the first and arguably one of the most impressive in the country thinking we would be staying close to the lake and to the mountains. Sounded perfect, but as we drove past the National Park we knew we had gone wrong. Nick had realised that he had made a serious error and that we did not actually want to be staying in Taupo after all. He had mis-read, or mis-understood the guidebook when he read it a few weeks previously and when we booked our campsite and we did not think to recheck it. 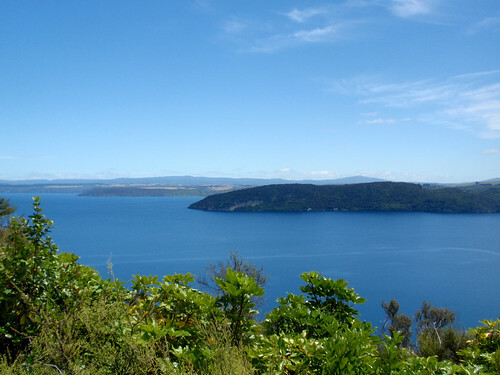 Taupo sits on the northern tip of it’s name sake Lake Taupo and is a good 100km (62m) away from the National Park - bugger!! 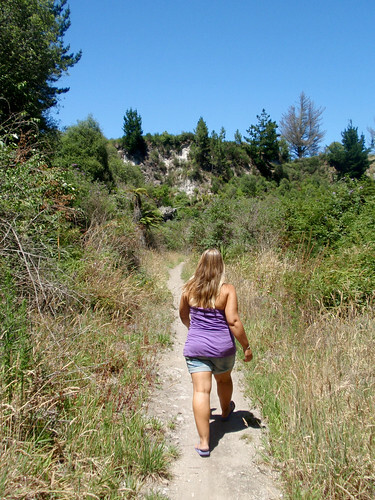 We arrived at All Season Holiday Park in the suburbs of Taupo with Nick in a foul mood. He was so annoyed at himself for not realising sooner, but sadly it was too late and we were just going to have make the most of it. The campsite was good though, a fairly standard small holiday park with everything we needed it was just a little too far from town to be able to just go for a wander, but too close to take the campervan. At least the sun was shining and we sat on our picnic bench soaking it up with a beer while I tired to reassure Nick that it was all ok.
After a good nights sleep, we were up and about by about 10:30 and had already decided to spend the day in and around Taupo. 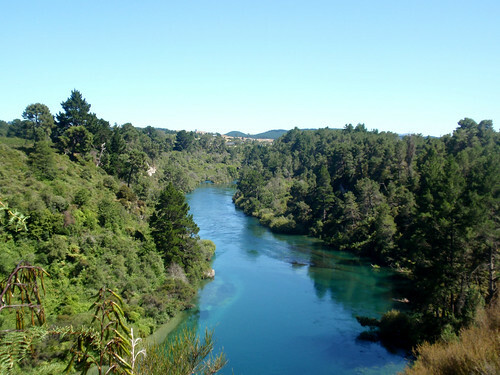 Our campsite was actually really close to the start of a walking track which went through the Rangatira Reserve and along the Waikato River. After about 20 minutes we heard lots of people and rounded a corner to see them all swimming in the river. As we drew closer we realised that their is a hot water stream which runs into the main river at this point making the water a beautiful bath-water temperature. Sadly we did not have out bathers with us so had to settle for dipping in our feet. 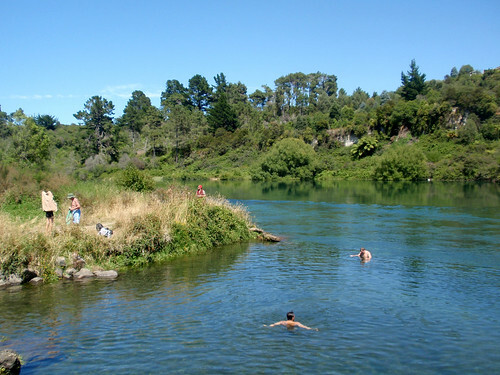 The walk carried on for another 45 minutes weaving it’s way in and out of the bush and following the river as it got faster and we could see more rapids until we reached the Huka Falls which are one of Taupo’s main attractions. These falls have been created by the sheer force of the river breaking it's way through the rocks carving a 15 metre wide, 10 metres deep gap which is continuing to grow. 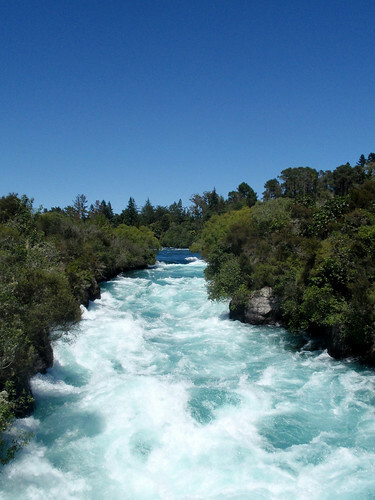 It's at this point the whole river bottle necks with 220,000 litres per second gushing through with a deafening roar. We decided to walk back on a different track, not realising until we were a fair way along that it was really a cycle track (which explained why it twisted and turned so much!). Luckily we only came across one bike who was going slow. The track also weaved it’s way through the bush and was very beautiful, although by now we were walking in the peak of the suns heat (again!). We made it back to campsite about 13:30 and grabbed our bathers, towels and picnic and set off for the lake. The walk was slightly further than we thought and it took us almost an hour before we actually reached the small and very disappointing man-made beach on the lakeside. 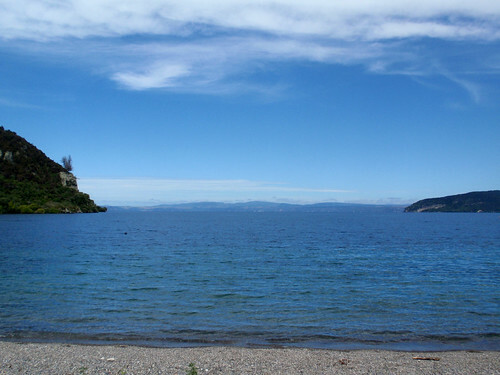 Lake Taupo is the largest lake in Australasia and is actually an enormous crater lake atop a super volcano - unfortunately it really is not that pretty, certainly compared to elsewhere we have been and we were again feeling pangs of disappointment. The sun was baking down on though, so we made the most of it and spent the afternoon swimming and sun-bathing. The next day after a lazy start and a visit to the i-Site, we decided to explore another area along the lake, Kinloch. 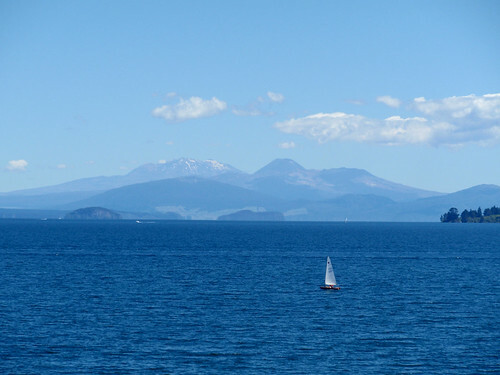 This time we were not disappointed, only 20km from the Taupo on the western bank we were greeted with a quiet, sleepy, port town with lovely views of the lake. 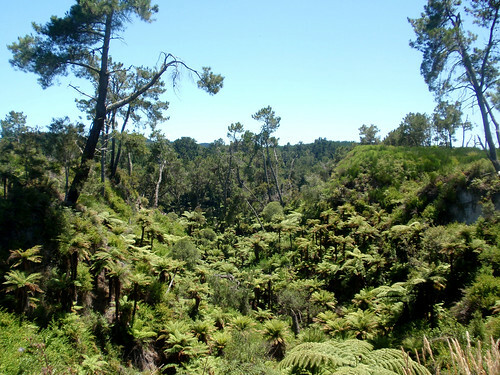 The i-Site said there was a walking trail we could do towards Whakaipo, another nice bay along the lake, however this walk was 26km round trip so we thought we would start it and turn round when we got tired or it the walk was boring. Unfortunately the walk was in the bush and after an half a hour we still couldn’t see the lakeside. Both of us secretly not enjoying the walk, we kept going, eventually coming to a slight clearing with ok views, but not spectacular as we have had in so many other places. We finally both revealed to each other that we weren’t enjoying the walk however there was promise of a lookout just over half way so both agreed that we would keep going till there then turn back. Again walking as fast as we could in the heat (yet again we walking in the height of the sun, doh!) we eventually came to a sign post for the lookout just 1.4km away. Taking the path we walked for a few minutes before we were inundated and attacked by Cicada’s about an inch long. The woods were deafening with their chirping and as we sped past they jumped out at us getting stuck in my hair and flying at Nick’s face. They continued to do this for the whole 1.4km until the noise suddenly stopped and the lookout opened up in front of us. Ummm! This wasn’t what we were expecting, there was a lonely bench looking out to the water which you could only see if you stood it, as trees blocked the view. The view wasn’t any better then the one when we stopped earlier either poo! 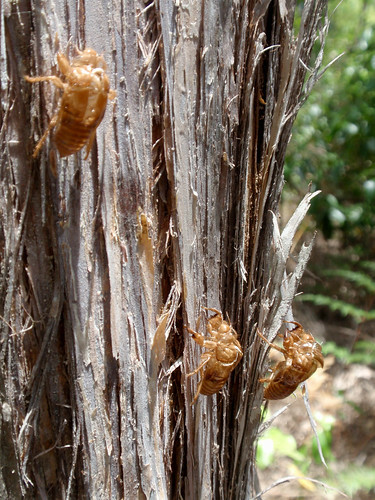 Taking a deep breath and plucking up the courage to go back in to the cicada infested woods, we ran the 1.4km back to the signpost. Out of breath but glad to be rid of the cicadas and their creepy skeletons clinging to all the trees, we walked as fast as we could to get back to Vanessa and the bay. We ended up walking a total of 15km (9 miles) in 2.5hrs in the baking heat, so when we arrived back we slipped in to swimwear and ran straight into the ice cold water. The rest of the afternoon was spent enjoying the sun, reading, eating and just chillin’ by the beautiful bay which made a great end to what had been a lightly disappointing couple of days. That evening we enjoyed dinner sat in the still warm sun (it stays hot and sunny till 9pm in New Zealand) with a cool beer packed ready for our adventure the next day. Wow! those insects look, well to be polite, **^%&"£ Well hard and wareing dockers, with prison tat's.